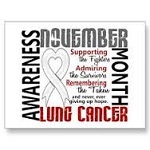 The goal of Lung Cancer Awareness Month is to address this disparity, and do it through education. Lung cancer is a largely invisible cancer, in part due to due to the stigma surrounding lung cancer through its association with smoking. Surveys have shown that 1 in 5 Canadians have less sympathy for people with lung cancer than for people with other cancers. By giving a platform to those affected by lung cancer, Lung Cancer Awareness Month is an effort to show people the real story behind this destructive cancer and encourage support for treatment. Withdrawal, cravings and mood swings are all unpleasant side effects that come along with tossing the tobacco. In fact, quitting is one of the biggest challenges a smoker will face, but it is also one of the best ways to reduce the risk of cancer.